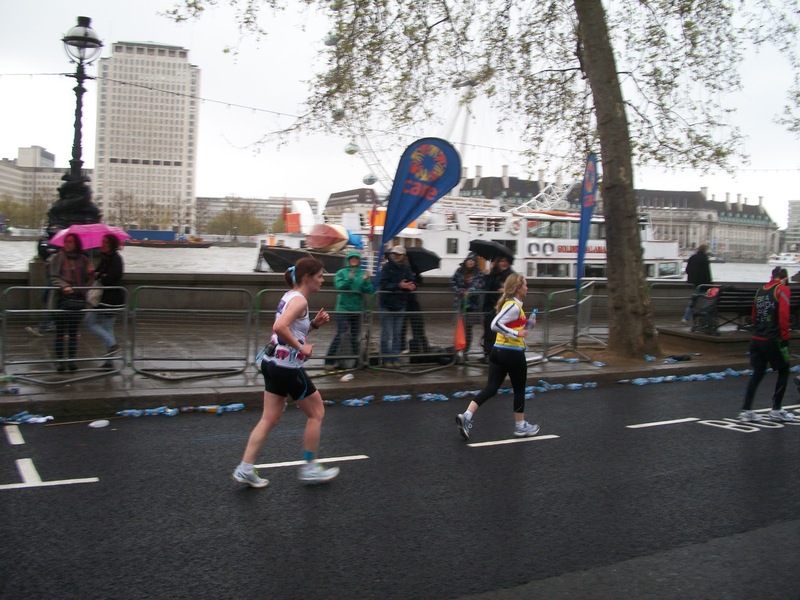 Virgin London Marathon 2012 – Race Report #2 – the Race! Warning – this is a VERY long post! Following on from Part 1, I finally crossed the start line, reached down to start my Garmin watch only to find the wait had been so long it had gone into ‘Powersave’ mode. Much fiddling of buttons later, I got it started. I was surprised to see some people were walking over the start line and not starting running at all. With my rotten training I planned a run-walk strategy that meant I would walk for 2 minutes at every mile marker to save my legs. I’d been worried about walking so early on in the race, but seeing people not even starting to run made me feel better – at least I was going to run *most* of it! The early miles passed by easily. 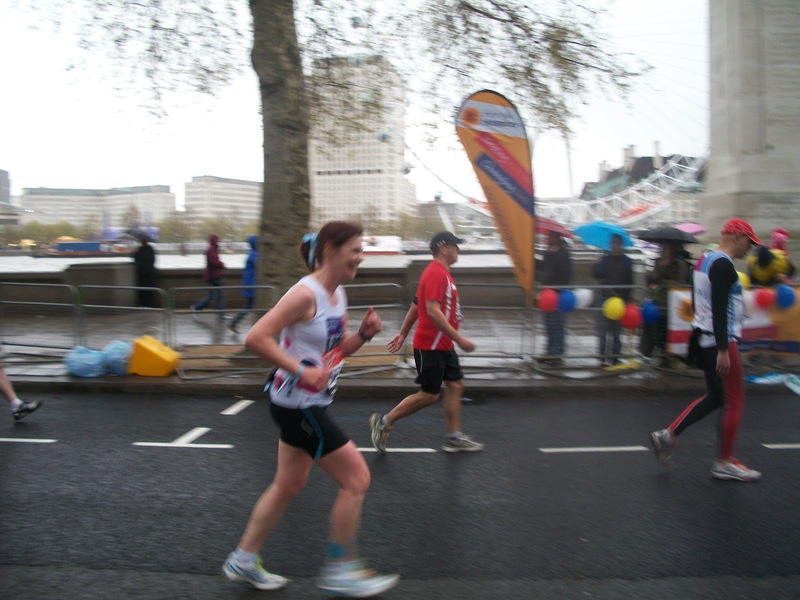 I tried very hard not to think too often “I’m running the LONDON MARATHON!” because if I did, my eyes would fill with tears and my lip would do that strange wobbly thing that lips do when you’re trying very hard not to cry. Running past a large barracks where an Olympic Test Event was taking place was quite inspiring, as it was a shooting event. Big city + gun shots = run faster!! 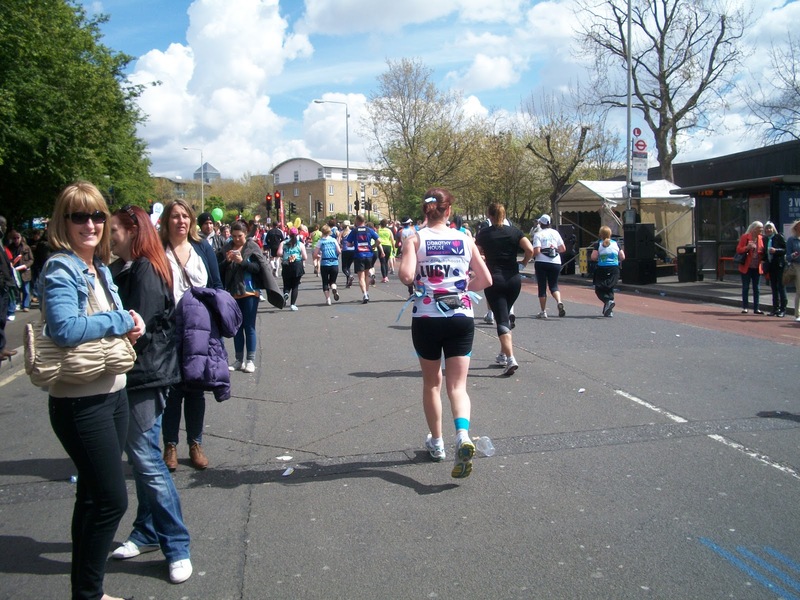 I had split the race into landmarks to aim for, as thinking about running 26.2 miles in one go was too daunting. Crossing the Meridian at Greenwich was the first of these. I was pleased to see the organisers had marked it with large red pillars with inflatable globes on the top so I couldn’t miss it! The Cutty Sark followed soon after, and this was as fantastic to see and run round as it was seeing on the telly. 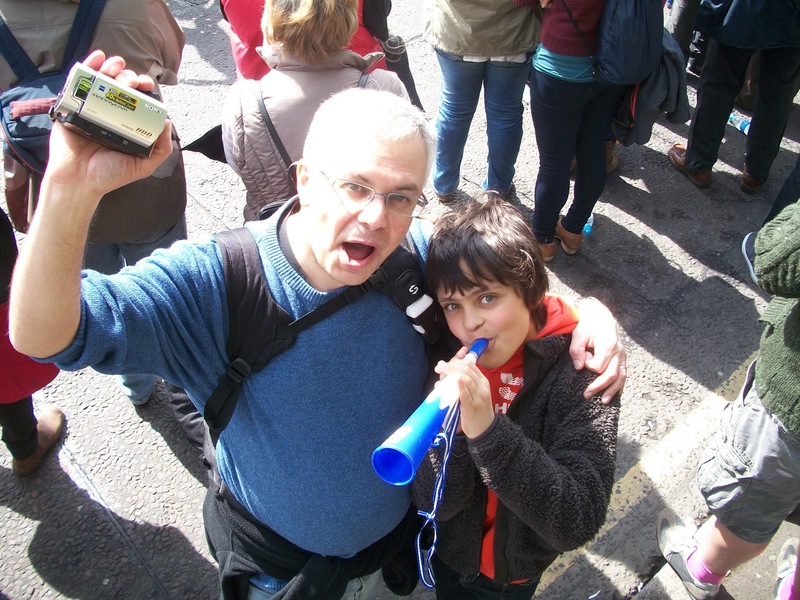 My family popped up at around eight and a half miles at Surrey Quays. It was great to see them, if only to reassure me that they had all got up (they were all still in bed when I left!). By an amazing co-incidence, about 200 metres before I saw them, I spotted another family from my son’s school whose brother / Uncle was competing in his wheelchair. The sun was feeling warm by now, and I was appreciating the water stations every mile. The next ‘landmark’ I was looking forward to was Tower Bridge – a truly iconic London landmark in anyone’s books. This was at 12.5 miles, so not quite half way. Running over it was as fantastic as I thought it would be – this was another moment when I could feel my eyes filling with tears. Turning onto The Highway was like running into a wall of noise. I could see runners already heading back the other way, towards the finish line. Most looked strong, but some looked like they’d had enough already. I congratulated myself on reaching half way still feeling strong, and pressed on. At this point my shin gave up the grumbling it had been trying for the first six miles or so, as it obviously realised I was ignoring it. My knees had tried alternately feeling sore, but I ignored them as well. I was running this marathon, and nothing was going to stop me! As I hit mile 14, I tried very hard not to think that this was all new territory, as my longest run in training had only been 14 miles. To take my mind off this unsettling fact, I thought about a colleague on a runner’s forum who had had to withdraw from the marathon in the last few weeks due to family circumstances. 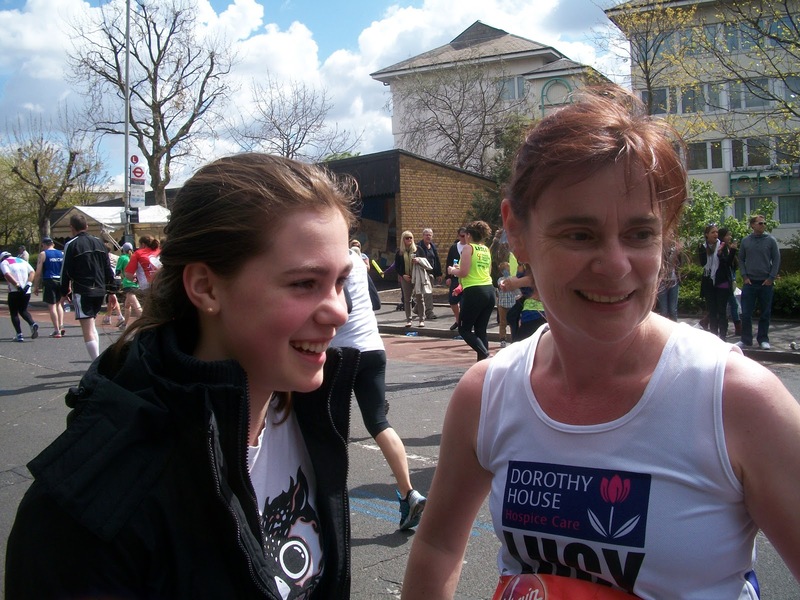 A group of us had decided to each run a mile for her, so she would be running a ‘virtual’ marathon with us.I remember feeling relief that this section was much quieter, and also the strange ‘velcro’ sound my shoes made on the road just after a ‘gel’ station. The road was so sticky, my shoes were literally sticking to it! There was a short underpass here, and as I stopped to walk,a lady walking just in front of me started chatting to me. Wearing a ‘Help the Hospices’ shirt, she told me she’d had awful training as well, interrupted with injury, but like me she was determined to get to the finish, with walking breaks if necessary. She encouraged me, then set off running again. It was such a relief to find someone in exactly the same situation as myself, I felt really heartened. 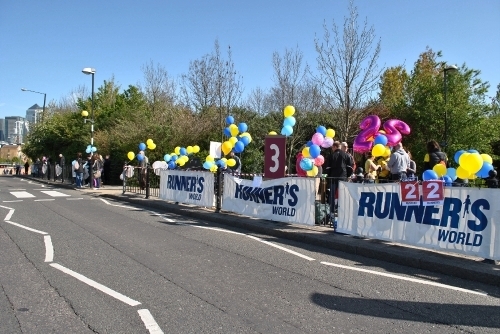 Mudchute Runner’s World Supporters Point. My mind was full of mile 17 now, and the famous Runner’s World ‘Mudchute’ cheerpoint. (I was relieved to find that Mudchute was the name of the DLR station, not some awful section of the route!) 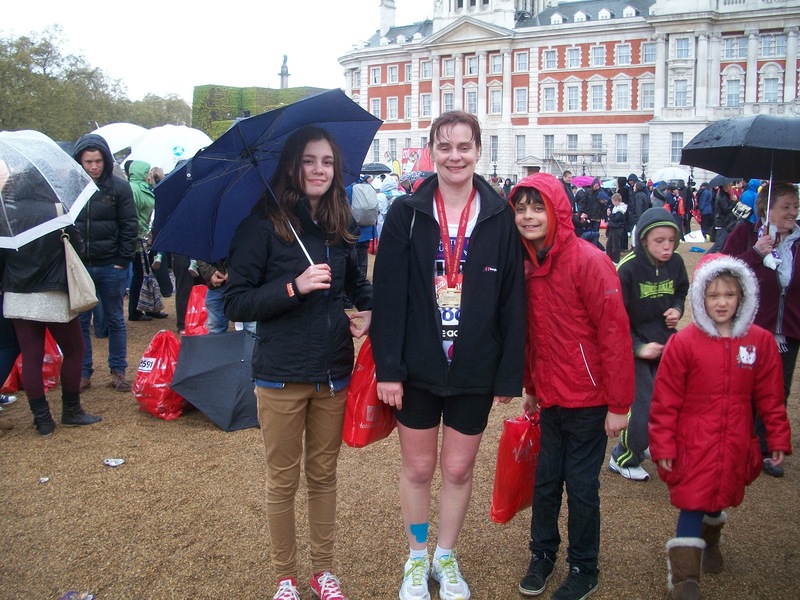 I saw my family just before Mudchute, then pressed on to find my friend Alice waiting there for me, with my extra supplies of gels and some veggie ‘Percy Pig’ sweets. She gave me a lovely hug (I was pretty sweaty by then, so it was very brave of her! ), I remember telling her my hips were killing me, and she sent me on my way. The great bit was I suddenly realised it was now single figures to the finish – just 9 miles to go! With this happy thought in mind, I suddenly decided I needed the toilet. Whether it was the gels catching up with my digestion,nerves, or just too much water, I knew I’d better stop before things became urgent. Every toilet stop for the last few miles had had enormous queues outside, so I’d not bothered waiting. Suddenly I came across a big line of portaloos with a relatively short queue, so I veered off the course and joined the queue. And waited. And waited. And did some stretches, and popped a couple of ibuprofen, and waited a bit more. We were under the line of the DLR here, where it travels on a large ‘flyover’ above the road. So I listened to the rumble of the trains as they went over, and watched hundreds of runners trot, jog and walk past. Some of the amazing and ridiculous fancy dress costumes I’d passed over the last few miles went past and I was starting to winder about the wisdom of stopping. Ah well – better than having to ‘do a Paula’ I guess! 15 minutes later I made it to the front of the queue and was soon back on the route. Little did I know that this stop, as well as taking so much time, would be causing consternation and distress as far away as Wiltshire and Cornwall. As well as calculating an accurate time for our marathon, the timing chips on our shoes were being used to record our time every 5 Kms. This was being updated on the website, so that anyone could track your time and see how you were doing. Unbeknownst to me, for some reason my 30K time wasn’t showing on the website (I’m sure I didn’t miss any of the timing mats! ), and then of course I was much later than expected to go over the 35K mat because of my long queue. My poor husband, whilst worrying over what had happened to me, was besieged by phone calls from family similarly worried as to what had happened. I’m surprised I didn’t hear the sighs of relief as I ran over the 35K mark! When we reached the Highway, I remembered running on the opposite side of the road at the half way point much earlier. I could see the sweeper trucks in action, with men power-washing the blue line from the road and sweeping up thousands of water bottles. The gel packets were still stuck to the road though! I was amazed to see one lady walking, still in the race, but with the trucks right behind her. I do wonder if she finished the race – I do hope so. It must take a lot of strength of character to keep on going, knowing everything’s being packed away just behind you. The route went though a tunnel – it was really dark, and I found the only portaloos on the course without a queue. I’m not surprised – they must have been pitch black inside! Coming out of the tunnel the rain had really started, along with a head wind which was not only cold, but was blowing bits from the trees right into my eyes. Squinting and splashing, I carried on. Suddenly in front of me, I saw the lady with the ‘Help the Hospices’ vest who had chatted to me earlier. She was walking, so I said hello, and tried to give her some encouragement, as she’d given me a boost earlier. London Eye in the background. See how fast my feet must be moving! Three miles to go, and onto the Embankment. Decided that I didn’t need to walk any more, so just ran from here on in. Most of the people around me were walking by now, and I admit it did feel good to pass so many people. Past a large billboard which said something like “Only 2.5 miles and you become part of history!” Amazingly my family popped up yet again here. I hadn’t been expecting to see them before the finish, but there they were – all getting wet, but still shouting and ‘hooting’ for me. When I’d seen them earlier, I’d stopped and had a little chat with them, however nothing was going to stop me now. I waved, and carried on. Seeing Big Ben appearing in front of us was very exciting, as this was the part of the course I’d walked on the day before. I knew that although the finish was close, it wasn’t just around the corner so I shouldn’t start my sprint finish just yet (hem hem!). Along Birdcage Walk, turn right, suddenly Buckingham Palace was on the left. I saw a red haired man at this point, and did wonder if it was Prince Harry. Under the spectators footbridge with ‘Only 385 yards to go’ on it, and then we were in the Mall. I could see the Finish line! Again I could feel tears welling up, but bit my lip. If I started crying now, I don’t think I’d have been able to stop. Finish line approaching, chose a ‘gantry’ to run under, cross the timing mats. Done. However, my body was still on automatic pilot to ‘keep on running’ and I actually carried on to the the next gantry before it dawned on me that I could stop running now! Staggered up a small ramp so people could snip the timing tag from my shoe, then down the other side to have a medal – THE medal put around my neck. Do you know, just typing this is making me feel emotional again! 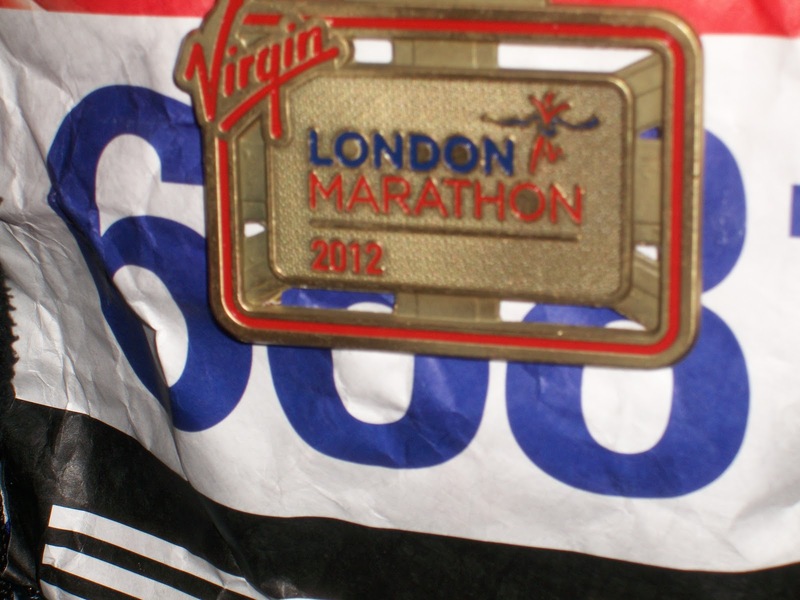 It felt very heavy, and wonderful as it bumped on my chest as I walked to have my official Finishers photo taken. I could feel the rain dripping off my nose as I posed, medal held high, but I didn’t care. Then I was given a goody bag, and a very kind St John’s Ambulance lady asked me if I wanted her to get my foil blanket for me. “Yes please!” She found it in the bag, helped me open and unfold it, and wrapped it around me. I’d always though people looked a bit silly wrapped in these blankets at the end of races, but I really appreciated how warm it felt. I was really feeling the need to have a blub at this point – out of relief, out of amazement, just out of pure emotion. Unfortunately, the finish area is so highly organised (as it has to be) that there was nowhere private to just have a moment. I could feel my face screwing up and tears starting, but a marshal jollied me along saying “Its all right love, you’ve finished now!”, so I pulled myself together and found my baggage truck. After getting my fleece on to warm me up, I made my way to the ‘Meet and Greet’ area where I’d arranged to meet my family. They weren’t there – which felt awful and lonely. Turns out they’d gone to try and find me, and we must have passed in the crowds. We finally met up, we took some photos, and set off to get back to the hotel. All I could think of now was the shower that was waiting for me! When I finally got into the shower I can’t describe how good it felt. I could have stayed in there for a long time!! I honestly enjoyed every minute of the marathon. I do want to do another one, to see what I can do with all the necessary training this time! Probably not London again though – I think that may have been a once-in-a-lifetime experience, and hopefully one I’ll remember for a very long time. A much shorter Part 3 follows – just a few thoughts afterwards, and some things for me to remember if I do another marathon!